With age, tissues lose their function and capacity to regenerate after being damaged. 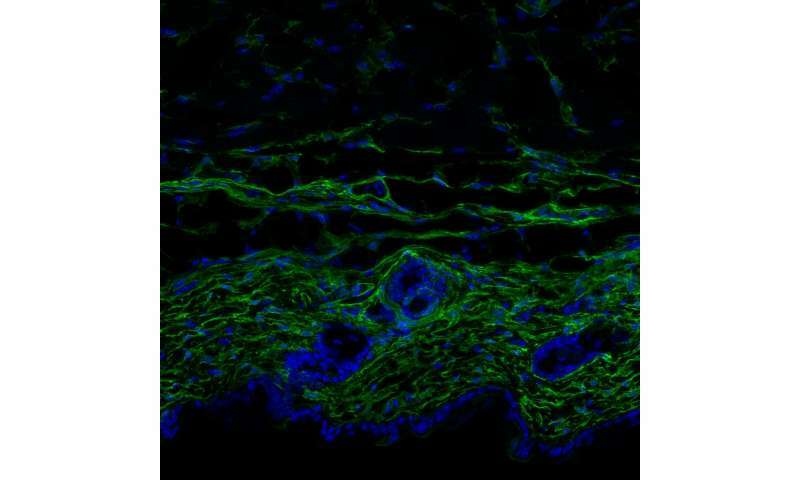 A study published today in Cell by scientists at the Institute for Research in Biomedicine (IRB Barcelona) and the Centro Nacional de Análisis Genómico of the Center for Genomic Regulation(CNAG-CRG) explains how dermal fibroblasts age. The main conclusion is that these fibroblasts lose their cell identity, as if they had forgotten what they are, and consequently their activity is altered, thus affecting tissue. The study reveals the cellular and molecular pathways affected by ageing and proposes that they could be manipulated to delay or even reverse the skin ageing process. Dermal fibroblasts are key for the production of collagen and other proteins that make up the dermis and that preserve the skin's function as a barrier. The activity of these cells is also crucial for the repair of skin damage. As people age, the dermis loses its capacity to produce collagen, and consequently its capacity to repair wounds is also significantly impaired. "The elderly face many problems in this regard, because their skin does not heal properly and its barrier properties are decreased, thus increasing the risk of skin infections and systemic infections," explains Salvador Aznar Benitah, ICREA researcher at IRB Barcelona and leader of the study. "The notion that the loss of cell identity is one of the underlying causes of ageing is interesting and one that we believe hasn't been considered before," he says. Holger Heyn, team leader at the CNAG-CRG and co-leader of the study, says, "Cutting-edge technologies allow molecular analysis of individual cells. In this study, we have applied advanced techniques to obtain high resolution images of fibroblasts as they age." Authored by IRB Barcelona Ph.D. student Marion Salzer, the study demonstrates that, during ageing, skin fibroblasts start to acquire many traits that are characteristic of adipocytes (fat cells). "This leads to them losing their cell identify and they also stop producing and secreting collagen like they should," explains Salzer. Although being basic research,Aznar Benitah says, "This new knowledge might not only have cosmetic applications, for example anti-aging skin treatment, but more importantly, also therapeutic applications aiming to help aged skin to form scar tissue faster and more efficiently after being damaged or after an operation."